The Rockville RHP7 is a 7" pair of universal headrest monitors. These feature a universal fit system and include all the necessary parts to fit in any vehicle. It has adjustable and detachable metal poles that adjust left to right from 4.3" inches to 7.5" inches. Rockville will have you up and running and enjoying your system in almost no time. Rockville takes the rocket science out of system integration, with our detailed and easy Do-It-Yourself Instructions. (Our instructions are written so that it is easy to understand). The headrests are manufactured of high quality leatherette with a plush comfortable finish and modeled to integrate perfectly into any vehicle. Two matching headrest are included. The colors are made to match the color of your interior. We make these in black, grey, and beige. Image quality is at an amazing 400 x 234 resolution. The picture is crystal clear. All Rockville video products go through an extensive testing phase before production. We take a sample unit and keep it on for days straight (24 hours a day) and ensure that the picture stays crystal clear even after the monitor being on for long periods of time. The RHP7 has great features. The built-in screens on the headrests can tilt forward and backwards for best viewing angles. There are also RCA audio/video output connections for video output to additional monitors in your system. There are internal speakers built into each headrest which allows for lower volume listening, so you do not disturb passengers in the front. You can also connect wireless IR headphones since this has a built in IR transmitter. If you connect this to your in-dash monitor, you will also have the option to hear the sound through your car stereo. We have so much confidence in our product and that they are built to last, we offer a full one year manufacturers warranty, please see below for all detailed specifications and Rockville's rigorous quality control standards. 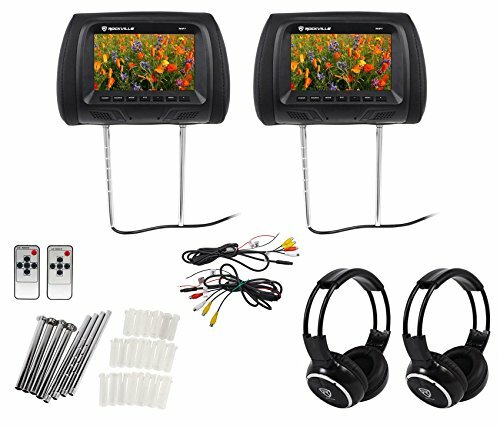 (2) Rockville RHP7-BK 7" Black High Resolution Car Headrest Monitor with Speakers and IR Transmitter. 7" High Resolution Pair of Monitors. Universal - Fits Virtually All Vehicles. Easy Installation - Everything is Included (Step by step install guide included). 480 x 234 High Screen Resolution. 16:9 (Wide Screen) or 4:3 (Letterbox) Switchable Aspect Ratio. 300:1 Contrast Ratio. Bright Backlit Display. Adjustable picture, brightness, contrast, volume. PAL/NTSC Auto Switching. IR Transmitter for IR Compatible Stereo Headphones (Sold Separately). Internal Stereo Speakers. Requires External A/V Source Such as In-Dash DVD Player. RCA A/V Output. Adjustable and Detachable Metal Poles (4.3in - 7.5in). Plastic Inserts for Custom Fit to Most Vehicles. Forward/Backwards Tilting Headrest. On Screen Display Menu In English, Spanish, French, Russain, Chinese, Italian, Portugese, German, Dutch. Color: Black (Also available in Grey and Tan). Power on/off. DC 12V Power Supply. Dimensions (HxWxD) 7.3" x 10.8" x 5.3". Height with poles 13.4". Accessories Included: 2 Multifunction Remote. Installation Cables. Plastic Fitment Inserts. Owners Manual.